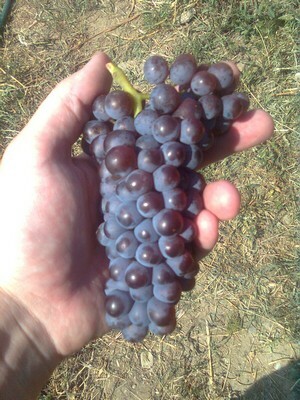 Pinot Gris is a mutant variety of Pinot Noir, and is distinguishable from the later by its lighter hue in coloration. 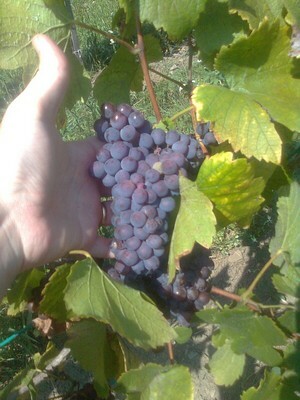 Although the color of Pinot Gris can range from almost white, to purple-brownish or even going almost to black, the grapes in many examples have a grayish hue to them. Cuttings of Pinot Gris were imported to Hungary by Cistercian monks in the 13th Century, where the variety became know as Szürkebarát, which means “gray monk” in Hungarian. Szürkebarát was, by some accounts, a favorite of the Emperor Charles IV, which gives this variety both a long and noble history in Hungary. Pinot gets its name most likely because the grapes grow in small pine cone-shaped clusters. Small pine cone shaped cluster of Pinot Gris after veraison. The name gray monk is perhaps also better in Hungary since they usually don’t look like pine cones here. 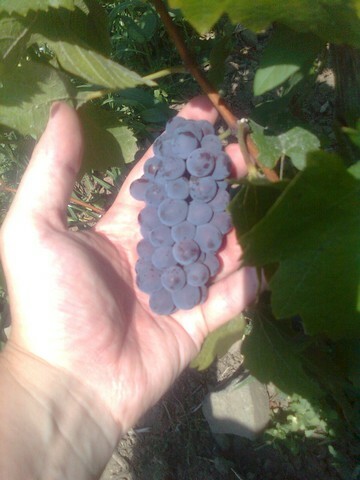 Larger cluster of Pinot Gris after veraison. Footnote: For those that believe I have a spelling deficiency, gray is the American spelling of the color and grey is more common in the Commonwealth of Nations. Or in other words, gray is a color while grey is a colour.